After the Pathankot air force base attack in January 2016, the government ordered a review of all military bases under the Philip Campose Committee. The committee felt that there were gaping holes in security arrangements at military bases and recommended measures to strengthen them. The recommendations of the committee remained with the Ministry of Defence, while the PM played musical chairs with the defence minister’s appointment. Then came the Uri attack, yet there was no response from the MoD. The Philip Campose committee in its assessment had categorically stated that paucity of funds was the major reason why camps could not be secured. Most camps lacked perimeter walls, electrified fences and CCTVs, which are basics even with private establishments that expect nothing more than small-time thefts. Military camps have been targets of militants, yet lacked these basics. For years, demands for security fencing were never accepted by the government, always claiming shortage of funds. Lack of security fencing was also one of the reasons for encroachments in unoccupied areas. Many camps, even in high-security zones, have nothing more than simple cattle fencing making them vulnerable to attack by militants. The Uri camp, attacked in September 2016, is an example. 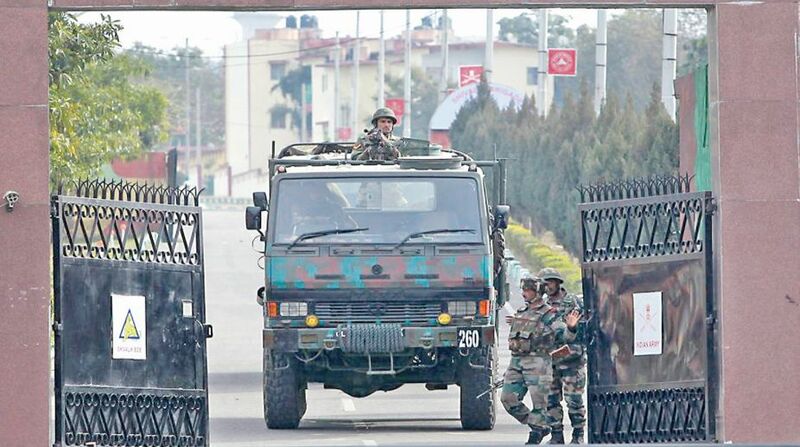 Military camps are located based on operational requirement and hence are concentrated heavily in the Jammu-Pathankot belt, in most cases closer than 30 km from the border. The size of a camp varies depending on the establishment located within and if they also cater for families. Hence, without basic security arrangements, most camps are easy targets especially for fedayeen, who are launched to kill and prepared to die. Targeting camps has multiple impacts. First, it boosts the morale of militants who otherwise remain under intense pressure, suffering casualties almost daily. Second, it boosts the morale of their handlers in Pakistan and the Pakistani army. Third, it has an adverse impact on Indian forces, especially if they lose family members in such strikes. Finally, it impacts the morale of the nation because a small team of militants causes disproportionate casualties. Even for the government, it becomes an embarrassment as it is targeted by the opposition. Yet the government slept all these years. It was after the Sanjuwan strike that the government finally woke up and announced a release of Rs 1,487 crore for improving security of army camps and gave a ten-month deadline for completion of the same. The announcement has been made, but will it be completed on time, especially as procedures laid down remain cumbersome and responsibilities for implementation are manifold? Construction of security walls is not the responsibility of army engineers, who in no time constructed Foot Overbridges in Mumbai, a task which the state and railways were unable to even commence. The resources employed were from the army’s training stores and not procured from the market, which would have led to immense delays. The entire border fence along the LoC was constructed by military engineers in a year, a feat unmatched by any other agency. In this case, funds may have been allotted, but supervision and coordination would remain that of the Military Engineering Service (MES), a quasi-military organization with almost no military ethos under the MoD, which is known to move at its own pace without responsibility or accountability. MES projects, even of small cost as compared to the border fence, take years to complete. In this case its laid-down procedures would imply over a year and a half before construction even commences. Such is their pace of functioning that funds allocated for normal projects in one year are only booked that year and the work may commence in the next, that if the military is lucky. Delays are common and so is lack of quality. In addition, there are approvals by Integrated Financial Advisors (IFAs), again representatives of the MoD at every level. MES would need their concurrence pre and post tenders and even before issuing the final contracts. There are in total nine steps in any MES work process, of which two may have been eliminated by the release of funds. Thus, all processes included, construction of walls may only begin in end 2019 or 2020. Speeding up may be possible if works are undertaken under Para 38 of the Works Procedure. Here again there are limitations, implying that the work should be under 1000-man days and for 15 days overall. Thus, there is no way, except in a few remote areas, where there is no MES cover and works are undertaken by military personnel, that the project would see the light of day before 2021-22. Thus, while the government has announced release of almost Rs 1500 crore and given the organisation ten months, who will move the elephants within the MoD? These archaic procedures, meant to be a means of establishing checks and balances have been the bane of the military for seven decades and would remain so. There have been instances when a few trees essential to be felled for constructing buildings worth tens of crores, led to cost escalation by over 20 per cent. The Defence Estates Officer, responsible for the trees, refused to have them felled unless they were pre-auctioned, which could not happen. Push and pressures by local army authorities including approaching the MoD failed. With so many organisations, all under the MoD, controlling construction, releasing land and funds, expecting the defence minister’s deadline to be met appears impossible. The only alternative to ensure timely construction would be for the MoD to issue an ordinance, approved by the government, for urgent execution of one-time work considering national security. This, issued under wartime requirements, may result in speeding up the work. The MoD should realise that mere release of funds is not the answer, it needs to think through the project and bypass archaic rules which could delay the process. Ignoring this would only result in more losses.